The brand new adidas EQT Support 93/17 will celebrate the 25th anniversary of its Equipment performance line in 2017. Kicking off the new year will be the EQT Support 93/17 – a bold development of the EQT design philosophy. 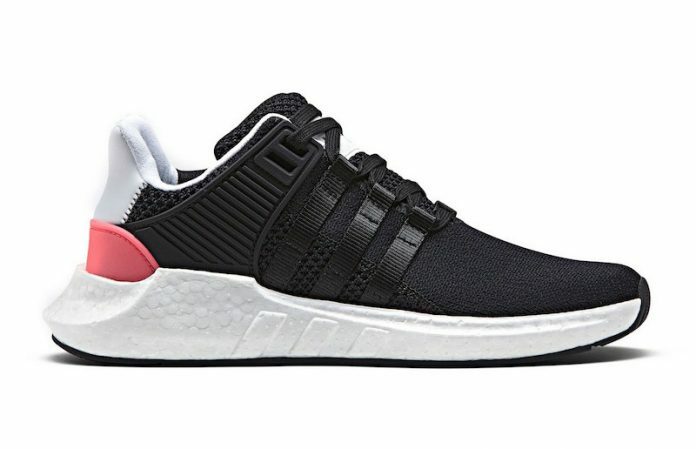 The EQT Support 93/17 reinterprets the original EQT Support 93 in an aggressive design language and combines authentic equipment materials with an uncompromising modern style. The woven knitted upper material in a pixelated, “Noise” motif is equipped with nubuck panels and the Three Stripes in webbing optics. Embroidery and a contrasts at the heel round off the aesthetics of the shoe. Featuring a Black upper with a newly introduced color palette, “Turbo Red” that covers the heel counter. A clean full-length White Boost midsole and Black rubber outsole completes the design. Look for the adidas EQT Support 93/17 to release on January 26th, 2017 at select adidas Originals retail stores and online at adidas.com. Let us know what you guys think of this new updated version of the EQT Support in the comments section. UPDATE: adidas has confirmed that the EQT Support 93/17 will launch on January 26th.